Keystone Custom Homes is well known in the Lancaster, Pa. community for all of its charity work. The Pennsylvania and Maryland home builder donates a portion of each home sale to its founder’s nonprofit, Homes for Hope, which builds homes and donates the majority of the proceeds to HOPE International, a Christian microfinance fighting global poverty. And, it also runs annual campaigns during the holidays to raise even more money for these organizations. However, this year, the builder extended their support for the community even further by collecting non-perishable food items for the Rescue Mission Food Drive. 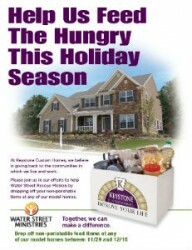 Keystone Custom Homes’ homeowners and residents of the community at large were encouraged to drop off their donations at any of the builder’s model homes. These items were then handed over to Water Street Mission, the York Rescue Mission, the Lebanon Rescue Mission and Bethseda Mission to help them serve more than 500,000 meals to the hungry and homeless during the holiday season. While it is always great to see the builder supporting the nonprofits that were founded by its own CEO, Jeff Rutt, it’s even more impressive to see it branching out to support other organizations within the community. Water Street Mission, which is run by Water Street Ministries, is Lancaster’s only year-round emergency shelter. It is here that homeless men, women and children can receive a free, hot meal seven days a week, attend daily worship services and get support for finding housing, childcare and employment.